You do the exact same thing… in reverse. I know what you’re thinking – that can’t be possible. What’s more, you’re missing out on half the market’s financial potential if you’re not profiting from stocks moving in both directions – up AND down. The world’s best companies – those we profile all the time – have the world’s best profit potential. Over time, that translates from higher revenues to higher profits and, in turn, to higher share prices. Buy “right” and you’ll laugh all the way to the bank. Finding big profits is more difficult than ever before because the amount of information investors have to deal with today is staggering. There’s Internet chat rooms, constantly updated headlines, curated content, advertisements… details. You can’t help but feel like you’re missing out on something key. The secret is getting back to what works. Velocity – a $5 word for momentum. That way, you know what to buy or sell and when to make your move for maximum profits. It’s given readers an incredible 72 winning plays this year alone. Some 20 of which – roughly 28% of the total – have been from downside moves like the one I’m going to share with you today – meaning when a stock drops. Just click here to learn more about the High Velocity Profits approach and join in today. Again, most people don’t think this is possible in a market that’s hitting new highs. What’s more, profits from downward prices drops often come faster than big gains to the upside. Especially when a company’s in transition. It’s an American icon, and people can’t imagine Harley going the “way of the dodo.” We are, after all, talking about one of the world’s most powerful brands and something so valuable that legions of the faithful ink it on unmentionable parts of their bodies! People said the same thing about Eastman Kodak Co. (NYSE:KODK), General Electric Co. (NYSE:GE), and Sears Holdings Corp. (NasdaqGS:SHLD) – all of which are fighting for their lives and all which have lost their investors billions of dollars. Tattoos aside. The fact that people feel so strongly about Harley makes your opportunity that much bigger and potentially that much more profitable! …sales have dropped 8.7% year-to-date here in the U.S., and Q2 Worldwide retail sales were down 3.6% per their Q2 earnings presentation. …only offers one bike under $10,000, which means that the young, urban, and increasingly female riders who are motorcycling’s future can’t afford to buy one. Most are $12 to $25k a copy. Or more! Harley-Davidson’s Piotroski Score is a 5… and dropping. That’s a measure you’ve heard me talk about before because it’s such an accurate measure of a company’s underlying financial strength and profit potential. Or, in this case, lack thereof. In this case, Harley’s numbers are going in exactly the opposite direction from its smaller-but-stronger archrival, Polaris Industries Inc. (NYSE:PII). The present trajectory suggests two things. Harley is rapidly losing its mojo, and the speed of its decline is such that the company may have a Piotroski Score of only one or two within the next 12 months. Loads of research – in addition to my own – shows that’s a range consistent with companies at imminent risk of financial failure. 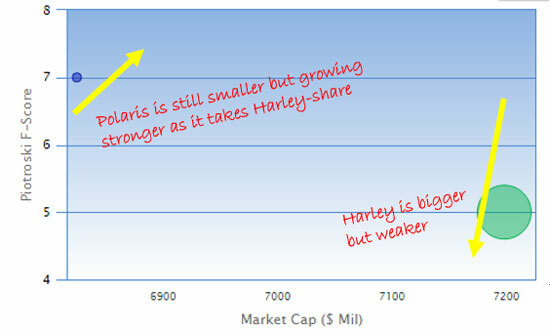 Sell Harley stock you own (if you own it) and buy Polaris instead. You always want to ride the strongest horse you can, especially when there are challenging market conditions ahead for the weaker player. Or, do both – the selling and the buying – at once in single transaction called a “Pairs Trade.” I’ve written about this Total Wealth Tactic extensively in the past, so I won’t repeat that here in the interest of time. However, I do encourage you to click here to read this article describing a pairs trade I recommended on VW when “dieselgate” broke. Buy long-term LEAPS put options that will appreciate in value as Harley struggles, and the company’s stock falls over time. I suggest the HOG February 15 2019 $42.50 Put (HOG190215P00042500) because they’re comparatively cheap at the moment and because they don’t expire until February 15, 2019… so there’s plenty of time for the trade to shape up. To be fair, you could also “short” Harley, but I wouldn’t recommend that in this instance because there are plenty of insiders who will fight tooth and nail against you as Harley comes unglued. I simply don’t think that’s worth the unlimited risk shorting entails in a rising market unless you’ve got the rock-solid discipline and risk management skills needed to pull it off. More advanced readers could also consider vertical bear spreads or even diagonals to harness the rising volatility that will accompany this trade as it builds. I’ll cover those another time or in Dallas in a few weeks at the MoneyShow when we see each other next! Just click here to register for your spot if you haven’t already! As always, Harley is a speculative trade, so treat it accordingly by limiting risk to money you can afford to be without if it doesn’t go as expected. The fall of an American icon is never easy. But, there’s no doubt it can be profitable for savvy investors following along.